Move over cupcakes—whoopie pies have come to town! Not quite a cake, not quite a cookie, these delightfully squidgy treats are the new baking craze sweeping the world. Originally an Amish tradition, they can be enjoyed in a variety of flavors with different fillings, as Hannah Miles shows in this colorful collection. Classic Pies are the perfect indulgence. Deliciously simple recipes include Classic Chocolate and Marshmallow Fluff Pies, Pumpkin Pies, Red Velvet Pies, and Pecan Pies. A chapter of less conventional but no less delicious Fruity Pies boasts a juicy Raspberry and Cream Pie, Key Lime Jello Pie, Lemon Sherbet Pie, and Banoffee Pie. Luxury Pies make perfect homebaked gifts and include chocolate-box pretty Rose and Violet Pies, refreshingly minty Grasshopper Pies, creamy Coconut Cloud Pies or grown-up. Almond and Amaretto Pies, perfect for dessert with a cup of coffee. Ideal for any celebration, Party Pies offers plenty of creative inspiration. Try a Giant Whoopie Birthday Pie, a towering rainbow-hued Whoopie Pie Croquembouche, or elegant Oyster Pies, each one complete with its own sugar pearl. Get baking today and create your own whoopie pie sensations. 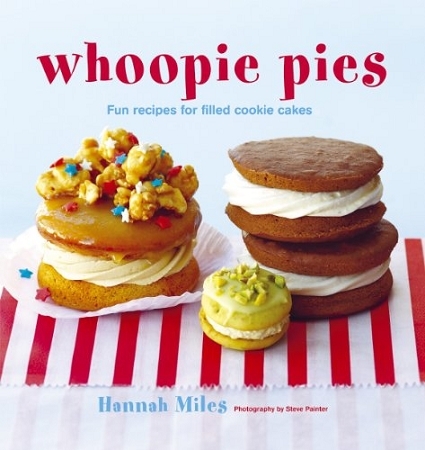 • Fun, retro food is back in vogue and whoopie pies are the latest baking craze, following hot on the heels of cupcakes. • More than 25 recipes for delightfully different home-baked treats. From simple classics to fun new ideas, there’s a whoopie pie to suit everyone. A lawyer and MasterChef finalist in 2007, Hannah Miles has developed a second highly successful career as a cook and food writer. She has a monthly column in Country Kitchen and Country & Town House magazines and writes for Delicious. She is also the author of Sundaes & Splits, Whoopie Pies, Mini Cakes, The Gluten-free Baker, and Popcorn Treats, all published by Ryland Peters & Small and lives in Bedfordshire, UK.